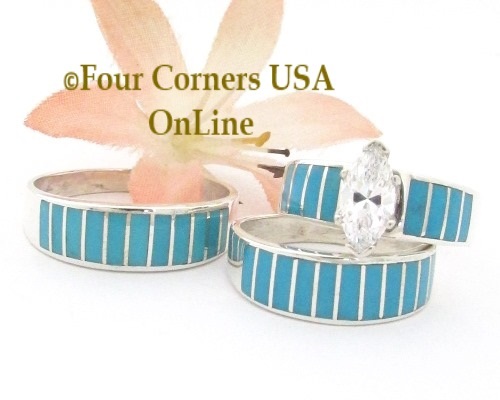 Turquoise Inlay Wedding Band Rings and Bridal Engagement Ring Sets by Native American Navajo Inlay Artisan Ella Cowboy. Ms. Cowboy has a wonderful Contemporary styling exemplified by her precision channel inlay and each Bridal Engagement Ring is complimented by a marquis cut cubic zirconia in a quality prong setting protecting the tips from damage.